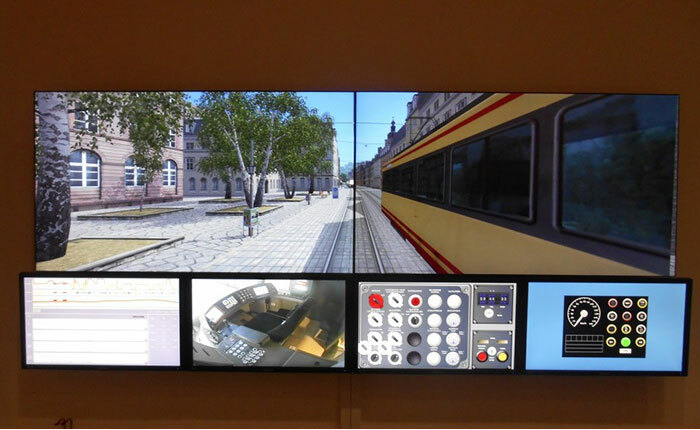 Our observer station allows trainees to observe a simulator session in real-time, or in replay mode. The trainer can also control what video sources are displayed on the observer station to ensure training integrity. You can create your own scenarios using our unique scenario building tool. Change selected routes including entry and exit points, direction of travel, position of points and signals status. Control initial state and operational conditions of the rail vehicle including vehicle faults, vehicle load and operating status; i.e., shut down, powered up, running. You can even choose different environmental conditions, including weather conditions, time of day, passenger density at stations, other stocks or objects on the network. 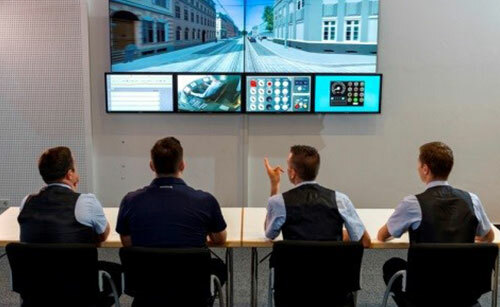 With our training solutions, one instructor station can supervise up to six simulators by using a multi-display mounted system. This allows the instructor to quickly create, edit, duplicate, save and test training scenarios for multiple simulation sessions. VR and AR elements are encapsulated by our patented Live3D™ vision technology. To be a truly effective training tool, the simulation must be realistic: Our Live3D™ technology provides this. When the trainee moves their head, their field of view also moves, providing a truly realistic training experience. Our simulator system allows you to replay a previously recorded simulation session on the instructor station. The system also allows you to record and replay markers during a training session, which you can jump to when reviewing. The Train Dynamics Analyzer, or TDA, simulates the dynamics of a freight train. The train can be any size or weight. The TDA is essentially a mini computer that simulates the longitudinal-fore and aft-dynamic force conditions that are generated in a train in operation. Incorporating this component in freight simulators is essential, so the driver can be trained in correct use of throttle, dynamic braking, automatic and independent brake systems, and sanding. With our track builder tool, you can generate and edit tracks, including the surrounding rail environment. Change weather, scenery, stations, segments of railway track and more, to create multiple learning environments for your trainees. 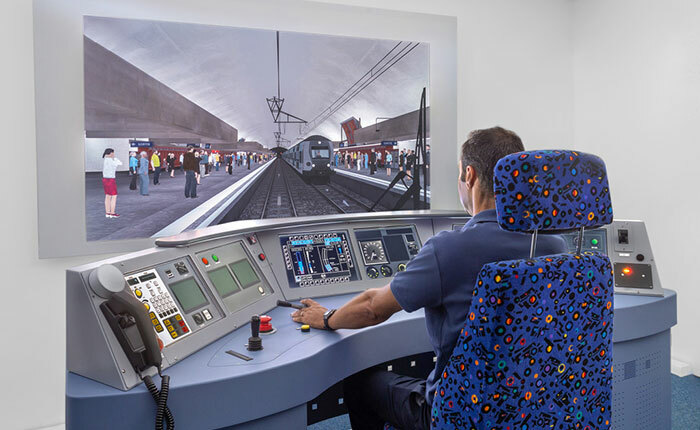 Our simulators offer the unique opportunity to train drivers in communicating with the Operational Control Centre for everything from passenger announcements, to responding to incidents taking place on the platform or within the train. 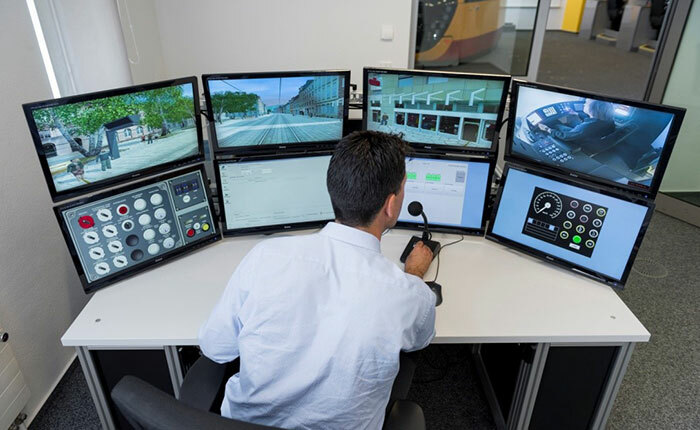 We understand the intricacies of safety control systems within rail and can provide simulation for the European Rail Traffic Management System (ERTMS), Positive Train Control (PTC), and Centralised Traffic Control System (CTCS).